For the so-called artifacts, the sandwich and balancing principles and their fractal/harmonic structure have already been found. 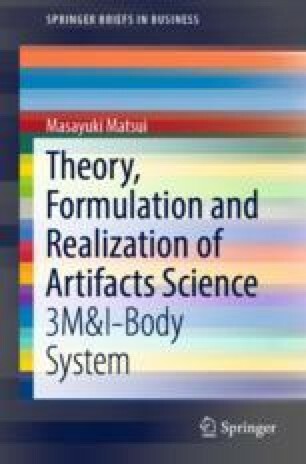 The ideal body of artifacts that satisfies these three principles is still unachievable at a realistic or designable situation. A management’s (designer’s) dilemma is the exchange of (multipower) balance problem of the function (max of needs) versus the role (max of rewards) of artifacts. This problem is here regarded as a class of inverse matrix at the matrix approach to nature versus artifacts and could be converted to the fractal structure of sandwich body by Matsui’s ME. One attempt would be challengeable to the realization (management) problem of the physics, economics, and enterprise in clock type. By our pair-map, these management (design) methods and formulations that pursue the Nash’s (trade-off) balancing at the economics versus reliability duality are attempted and proposed toward the nature versus artifacts science. Another attempt would show the principal (waist) logic for the realization of an enterprise robot or jidoka management at the coming ITC-age society and would develop a scheme of demand-to-supply enterprise robots with ODICS II engine (heart) of convenience type by dual PDCA cycle. The goal of dual PDCA cycle is to employ the Nash-like solution of Heart & waist (W=H) type in fund optimization. Finally, it is remarked that the ODICS II engine is of pump type for inventory (blood) and is the advanced version of the on-demand inventory control system (ODICS) made in 2005, and other engines such as SALPS and DSMAP are also available at manufacturing types.